The most important thing to keep in mind when you’re unemployed is this: until you have a hiring contract in hand, the job search is your job. By this I mean that as you should treat your job search just like every other job you’ve worked. Sure, you’re not getting paid for it, but one day it will lead to another paycheck, so you should approach it seriously and in an organized fashion. If you can keep yourself in a professional mindset while you look for a job, you’ll have a greater chance at succeeding. Here are a few tips to help you as look for another job. Because you want to approach the job search as if it were your job, you should try to maintain as professional an attitude as possible. Don’t let yourself get down into an unemployment rut. Try to maintain whatever routine you followed before you lost your previous job, or you should establish a new routine that will keep you focused. Wake up at the same time every morning and dress for work. You don’t have to put on a tie or high heels, but certainly be sure you dress in a way that will keep you focused on your objectives. In other words, it’s easier to lounge around the house all day if you never change out of your pajamas. 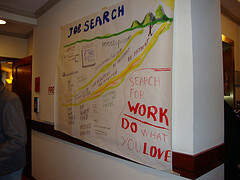 Just as you would have objectives to meet at a real job, so should you have objectives to meet for your job search. Think of how long you can live comfortably without a job, and then figure out what you need to do in order to find a job by the end of that window. Ideally, you’ll be sending out a certain number of applications and resumes each week. You’ll want to figure out if you’re going to stay within the same career track or try to branch out. At your old job, you had a routine you most likely followed each day, so do the same for your job search. For example, in the morning you could spend a few hours browsing and researching potential job openings. Take an hour to follow up with contacts in your network who might be able to help you. Break for lunch and then get to work on the applications you’ve got in-progress. Finally, end the day by sending out a batch and adding it to your tally of active applications. Every time the numbers rise in your spreadsheet, you’re getting closer to your goal. Whatever you do, make sure you meet your goals each week. This might mean that you have to ‘work overtime,’ but remember, the extra effort is important to finally getting that paycheck. Likewise, if you hear of a hot lead, then you might want to turn all of your attention on that. You’ll want to constantly evaluate your goals and how you’re achieving them. This will help you adjust your routine as conditions in the job market change. Finally, make sure you’re accountable and have to answer to a ‘supervisor’ each week. Ask one of your friends or your spouse of a family member to check on you Friday after ‘work.’ Sometimes simply talking about your process to another person can help motivate you or lead to your coming up with a new plan. This is great advice! It is so easy to become despondant when job hunting, so this advice on a change of attitude is key. I am a recent graduate and struggled to get into a routine of job hunting – it was far too easy to enjoy the summer! I think those new to job hunting, like graduates, really struggle with this. Signing up to a specialist graduate recruitment agency really helped me. They had fantastic graduate jobs advertised, but most importantly they gave me great advice. They even gave me temp work to boost my CV whilst I was looking for jobs! Pingback: On The Job – Searching Is (Should Be) A Full Time Job!